"Lord Burghley" redirects here. For other holders of the title, see Baron Burghley. William Cecil, 1st Baron Burghley, KG, PC (13 September 1520 – 4 August 1598) was an English statesman, the chief advisor of Queen Elizabeth I for most of her reign, twice Secretary of State (1550–1553 and 1558–1572) and Lord High Treasurer from 1572. Albert Pollard says, "From 1558 for forty years the biography of Cecil is almost indistinguishable from that of Elizabeth and from the history of England." Cecil set as the main goal of English policy the creation of a united and Protestant British Isles. His methods were to complete the control of Ireland, and to forge an alliance with Scotland. Protection from invasion required a powerful Royal Navy. While he was not fully successful, his successors agreed with his goals. Cecil was not a political genius or an original thinker; but he was a cautious man and a wise counsellor, with a rare and natural gift for avoiding dangers. [according to whom?] In 1587, Cecil persuaded the Queen to order the execution of the Roman Catholic Mary, Queen of Scots, after she was implicated in a plot to assassinate Elizabeth. He was the father of Robert Cecil, 1st Earl of Salisbury and founder of the Cecil dynasty (Marquesses of Exeter and of Salisbury) which has produced many politicians including two prime ministers. 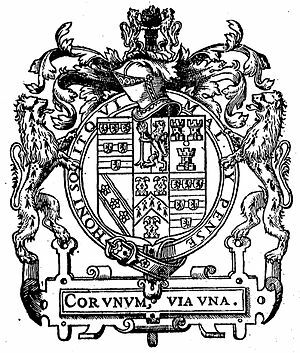 Cecil was born in Bourne, Lincolnshire, in 1520, the son of Sir Richard Cecil, owner of the Burghley estate (near Stamford, Lincolnshire), and his wife, Jane Heckington. Pedigrees, elaborated by Cecil himself with the help of William Camden the antiquary, associated him with the Welsh Cecils or Seisyllts of Allt-Yr-Ynys, Walterstone, on the border of Herefordshire and Monmouthshire. Cecil is an anglicisation of the Welsh Seisyllt. Lord Burghley acknowledged that the family was from the Welsh Marches in a family pedigree painted at Theobalds. The Lord Treasurer's grandfather, David had moved to Stamford. David Cecil secured the favour of the first Tudor king, Henry VII, to whom he was yeoman of the chamber. He was elected Member of Parliament for Stamford five times, between 1504 and 1523. He was Sergeant-of-Arms to Henry VIII in 1526, Sheriff of Northamptonshire in 1532, and a Justice of the Peace for Rutland. He, according to Burghley's enemies, kept the best inn in Stamford. His eldest son, Richard, Yeoman of the Wardrobe (died 1554), married Jane, daughter of William Heckington of Bourne, and was father of three daughters and the future Lord Burghley. William, the only son, was put to school first at The King's School, Grantham, and then Stamford School, which he later saved and endowed. In May 1535, at the age of fourteen, he went to St John's College, Cambridge, where he was brought into contact with the foremost scholars of the time, Roger Ascham and John Cheke, and acquired an unusual knowledge of Greek. He also acquired the affections of Cheke's sister, Mary, and was in 1541 removed by his father to Gray's Inn, without having taken a degree, as was common at the time for those not intending to enter the Church. The precaution proved useless and four months later Cecil committed one of the rare rash acts of his life in marrying Mary Cheke. The only child of this marriage, Thomas, the future Earl of Exeter, was born in May 1542, and in February 1543 Cecil's first wife died. Three years later, on 21 December 1546 he married Mildred Cooke, who was ranked by Ascham with Lady Jane Grey as one of the two most learned ladies in the kingdom, (aside from another of Ascham's pupils, Elizabeth Tudor, who was later Elizabeth I) and whose sister, Anne, was the wife of Sir Nicholas Bacon, and later the mother of Sir Francis Bacon. William Cecil's early career was spent in the service of the Duke of Somerset (a brother of the late queen, Jane Seymour), who was Lord Protector during the early years of the reign of his nephew, the young Edward VI. Cecil accompanied Somerset on his Pinkie campaign of 1547 (part of the "Rough Wooing"), being one of the two Judges of the Marshalsea. The other was William Patten, who states that both he and Cecil began to write independent accounts of the campaign, and that Cecil generously contributed his notes for Patten's narrative, The Expedition into Scotland. Cecil, according to his autobiographical notes, sat in Parliament in 1543; but his name does not occur in the imperfect parliamentary returns until 1547, when he was elected for the family borough of Stamford. In 1548, he is described as the Protector's Master of Requests, which apparently means that he was clerk or registrar of the court of requests which Somerset, possibly at Hugh Latimer's instigation, illegally set up in Somerset House to hear poor men's complaints. He also seems to have acted as private secretary to the Protector, and was in some danger at the time of the Protector's fall in October 1549. The lords opposed to Somerset ordered his detention on 10 October, and in November he was in the Tower of London. Cecil ingratiated himself with John Dudley, then Earl of Warwick, and after less than three months he was out of the Tower. On 5 September 1550 Cecil was sworn in as one of King Edward's two secretaries of state. In April 1551, Cecil became chancellor of the Order of the Garter. But service under Warwick (by now the Duke of Northumberland) carried some risk, and decades later in his diary, Cecil recorded his release in the phrase "ex misero aulico factus liber et mei juris" ("I was freed from this miserable court"). 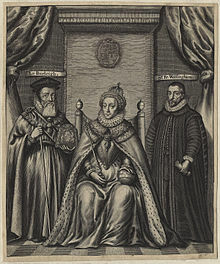 To protect the Protestant government from the accession of a Catholic queen, Northumberland forced King Edward's lawyers to create an instrument setting aside the Third Succession Act on 15 June 1553. (The document, which Edward titled "My Devise for the Succession", barred both Elizabeth and Mary, the remaining children of Henry VIII, from the throne, in favour of Lady Jane Grey.) Cecil resisted for a while, in a letter to his wife, he wrote: "Seeing great perils threatened upon us by the likeness of the time, I do make choice to avoid the perils of God's displeasure." But at Edward's royal command he signed it. He signed not only the devise, but also the bond among the conspirators and the letters from the council to Mary Tudor of 9 June 1553. Years afterwards, he pretended that he had only signed the devise as a witness, but in his apology to Queen Mary I, he did not venture to allege so flimsy an excuse; he preferred to lay stress on the extent to which he succeeded in shifting the responsibility on to the shoulders of his brother-in-law, Sir John Cheke, and other friends, and on his intrigues to frustrate the Queen to whom he had sworn allegiance. There is no doubt that Cecil saw which way the wind was blowing, and disliked Northumberland's scheme; but he had not the courage to resist the duke to his face. As soon, however, as the duke had set out to meet Mary, Cecil became the most active intriguer against him, and to these efforts, of which he laid a full account before Queen Mary, he mainly owed his immunity. He had, moreover, had no part in the divorce of Catherine of Aragon or in the humiliation of Mary during Henry's reign, and he made no scruple about conforming to the Catholic reaction. He went to Mass, confessed, and in no particular official capacity went to meet Cardinal Pole on his return to England in December 1554, again accompanying him to Calais in May 1555. He was elected to Parliament as knight of the shire for Lincolnshire in 1553 (probably), 1555 and 1559 and for Northamptonshire in 1563. It was rumoured in December 1554 that Cecil would succeed Sir William Petre as Secretary of State, an office which, with his chancellorship of the Garter, he had lost on Mary's accession to the throne. Probably the Queen had more to do with this rumour than Cecil, though he is said to have opposed, in the parliament of 1555 (in which he represented Lincolnshire), a bill for the confiscation of the estates of the Protestant refugees. But the story, even as told by his biographer, does not represent Cecil's conduct as having been very courageous; and it is more revealing that he found no seat in the parliament of 1558, for which Mary had directed the return of "discreet and good Catholic members". The Duke of Northumberland had employed Cecil in the administration of the lands of Princess Elizabeth. Before Mary died he was a member of the "old flock of Hatfield", and from the first, the new Queen relied on Cecil. He was also the cousin of Blanche Parry, Elizabeth's longest serving gentlewoman and close confidante. The Queen appointed Cecil Secretary of State. His tight control over the finances of the Crown, leadership of the Privy Council, and the creation of a highly capable intelligence service under the direction of Francis Walsingham made him the most important minister for the majority of Elizabeth's reign. Dawson argues that Cecil's long-term goal was a united and Protestant British Isles, an objective to be achieved by completing the conquest of Ireland and by creating an Anglo-Scottish alliance. With the land border with Scotland safe, the main burden of defence would fall upon the Royal Navy, Cecil proposed to strengthen and revitalise the Navy, making it the centerpiece of English power. He did obtain a firm Anglo-Scottish alliance reflecting the common religion and shared interests of the two countries, as well as an agreement that offered the prospect of a successful conquest of Ireland. However, his strategy ultimately failed. His idea that England's safety required a united British Isles became an axiom of English policy by the 17th century. Though a Protestant, Cecil was not a religious purist; he aided the Protestant Huguenots and Dutch just enough to keep them going in the struggles which warded danger from England's shores. But Cecil never developed that passionate aversion from decided measures which became a second nature to Elizabeth. His intervention in Scotland in 1559–60 showed that he could strike hard when necessary; and his action over the execution of Mary, Queen of Scots, proved that he was willing to take on responsibilities from which the Queen shrank. Generally he was in favour of more decided intervention on behalf of continental Protestants than Elizabeth would have liked, but it is not always easy to ascertain the advice he gave. He left endless memoranda lucidly (nevertheless sometimes bordering on the ridiculous) setting forth the pros and cons of every course of action; but there are few indications of the line which he actually recommended when it came to a decision. How far he was personally responsible for the Anglican Settlement, the Poor Laws, and the foreign policy of the reign, remains to a large extent a matter of conjecture. However, it is most likely that Cecil's views carried the day in the politics of Elizabethan England. The historian Hilaire Belloc contends that Cecil was the de facto ruler of England during his tenure as Secretary; pointing out that in instances where his and Elizabeth's wills diverged, it was Cecil's will that was imposed. Leimon and Parker argue that Cecil was the principal protector of Edward Stafford, the English ambassador to Paris and a paid spy who helped the Spanish at the time of the Spanish Armada. However, they do not claim Cecil knew of Stafford's treason. Cecil's share in the Religious Settlement of 1559 was considerable, and it coincided fairly with his own Anglican religious views. Like the mass of the nation, he grew more Protestant as time wore on; he was happier to persecute Catholics than Puritans; and he had no love for ecclesiastical jurisdiction. His prosecution of the English Catholics made him a recurring character in the "evil counsellor polemics", written by Catholic exiles across the channel. In these pamphlets, polemicists painted a black picture of Burghley as a corrupting influence over the queen. "The Queen will listen to none but unto him", exiled Catholic intelligencer Richard Verstegan wrote, "and somtymes, she is faine to come to his bedsyde to entreat him in some-things." He warmly remonstrated with John Whitgift, the Anglican Archbishop of Canterbury, over his persecuting Articles of 1583. The finest encomium was passed on him by the queen herself, when she said, "This judgment I have of you, that you will not be corrupted with any manner of gifts, and that you will be faithful to the state." Cecil sought to ensure that policy was commensurate with the royal finances, which often led him advocating a cautious policy. His economic ideas were influenced by the Commonwealthmen of Edward VI's reign: he believed in the necessity of safeguarding the social hierarchy, the just price and the moral duties due to labour. In his economic policy he was motivated by a variety of factors, including those of national independence and self-sufficiency, as well as seeking to balance the interests of the Crown and the subject. Cecil did not believe that economics and politics were separate or that there was a dichotomy between power and plenty. One of his biographers asserted that, for Burghley, "power was for defence from external enemies; plenty for security at home. Cecil pursued both power and plenty. They were the foreign and domestic aspects of his economic nationalism". He deplored the reliance on "foreign corn" and during an economic depression sought to ensure employment due to his fears of "tumults". Cecil also used patronage to ensure the loyalty of the nobility. William Cecil represented Lincolnshire in the Parliament of 1555 and 1559, and Northamptonshire in that of 1563, and he took an active part in the proceedings of the House of Commons until his elevation to the peerage; but there seems no good evidence for the story that he was proposed as Speaker in 1563. 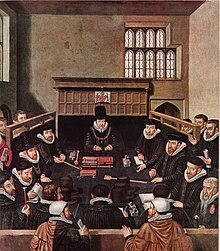 In January 1561, he was given the lucrative office of Master of the Court of Wards and Liveries in succession to Sir Thomas Parry. As Master of the Court of Wards, Cecil supervised the raising and education of wealthy, aristocratic boys whose fathers had died before they reached maturity. 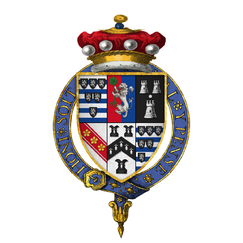 These included Edward de Vere, 17th Earl of Oxford, Henry Wriothesley, 3rd Earl of Southampton, Robert Devereux, 2nd Earl of Essex and Roger Manners, 5th Earl of Rutland. He is widely credited with reforming an institution notorious for its corruption, but the extent of his reforms has been disputed by some scholars. In February 1559, he was elected Chancellor of Cambridge University in succession to Cardinal Pole; he was created M.A. of that university on the occasion of Elizabeth's visit in 1564, and M.A. of Oxford on a similar occasion in 1566. He was the first Chancellor of University of Dublin, between 1592 and 1598. On 25 February 1571, Queen Elizabeth elevated him as Baron Burghley. The fact that Cecil continued to act as Secretary of State after his elevation illustrates the growing importance of that office, which under his son became a secretary of the ship of state. In 1572 Cecil privately admonished the queen for her "doubtful dealing with the Queen of Scots." He made a strong attack on everything he thought Elizabeth had done wrong as queen. In his view, Mary had to be executed because she had become a rallying cause for Catholics and played into the hands of the Spanish and of the pope, who excommunicated Elizabeth in 1570 and sent in Jesuits to organise a Catholic underground. By 1585–6 these missionaries had set up a secret, but highly effective, underground system for the transport and support of priests arriving from the Continent. Elizabeth's indecision was maddening; finally in 1587 Elizabeth had Mary executed. In 1572, Lord Winchester, who had been Lord High Treasurer under Edward, Mary and Elizabeth, died. His vacant post was offered to Robert Dudley, 1st Earl of Leicester, who declined it and proposed Burghley, stating that the latter was the more suitable candidate because of his greater "learning and knowledge". The new Lord Treasurer's hold over the queen strengthened with the years. Burghley House, near the town of Stamford, was built for Cecil, between 1555 and 1587, and modelled on the privy lodgings of Richmond Palace. It was subsequently the residence of his descendants, the Earls and Marquesses of Exeter. The house is one of the principal examples of 16th-century Elizabethan architecture, reflecting the prominence of its founder, and the lucrative wool trade of the Cecil estates. Cecil House was also built by Cecil in the 16th Century, as his London residence, an expansion of an already existing building. [a] Queen Elizabeth I supped with him there, in July 1561, "before my house was fully finished", Cecil recorded in his diary, calling the place "my rude new cottage." It was later inherited by his elder son, Thomas Cecil, 1st Earl of Exeter, and was known as "Exeter House". A new Theobalds House, just off the main road north from London to Ware, was built between 1564 and 1585 by the order of Cecil, intending to build a mansion partly to demonstrate his increasingly dominant status at the Royal Court, and also to provide a palace fine enough to accommodate the Queen on her visits. The Queen visited there eight times, between 1572 and 1596. Cecil collapsed (possibly from a stroke or heart attack) in 1598. Before he died, Robert, his only surviving son by his second wife, was ready to step into his shoes as the Queen's principal adviser. 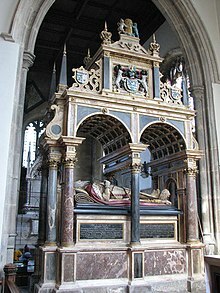 Having survived all his children except Robert and Thomas, Burghley died at his London residence, Cecil House on 4 August 1598, and was buried in St Martin's Church, Stamford. Sir Thomas Cecil (b. 5 May 1542), who inherited the Barony of Burghley upon the death of his father, and was later created Earl of Exeter. Anne Cecil (b. 5 December 1556), who was the first wife of Edward de Vere, 17th Earl of Oxford, and served as a Maid of Honour to Queen Elizabeth I before her marriage. Sir Robert Cecil (b. 1 June 1563), who inherited his father's political mantle, taking on the role of Chief Minister, and arranging a smooth transfer of power to the Stuart administration under King James I of England. He was later created Baron Cecil, Viscount Cranborne, and finally Earl of Salisbury. Elizabeth Cecil (b. 1 July 1564), who married William Wentworth of Nettlestead (c.1555-1582), eldest son of Thomas Wentworth, 2nd Baron Wentworth. Cecil's descendants include the Marquesses of Exeter, descended from his elder son Thomas; and the Marquesses of Salisbury, descended from his younger son Robert. One of the latter branch, Robert Cecil, 3rd Marquess of Salisbury (1830–1903), served three times as Prime Minister under Queen Victoria and her son, King Edward VII of England. William Cecil's private life was upright; he was a faithful husband, a careful father and a dutiful master. A book-lover and antiquarian, he made a special hobby of heraldry and genealogy. It was the conscious and unconscious aim of the age to reconstruct a new landed aristocracy on the ruins of the old, Catholic order. As such, Burghley was a great builder, planter and patron. All the arts of architecture and horticulture were lavished on Burghley House and Theobalds, which his son exchanged for Hatfield. William Cecil's public conduct does not present itself in quite so amiable a light. As his predecessor, Lord Winchester, said of himself, he was sprung "from the willow rather than the oak". Neither Cecil nor Lord Winchester were men to suffer for the sake of obstinate convictions. The interest of the state was the supreme consideration for Burghley, and to it he had no hesitation in sacrificing individual consciences. He frankly disbelieved in toleration; "that state", he said, "could never be in safety where there was a toleration of two religions. For there is no enmity so great as that for religion; and therefore they that differ in the service of their God can never agree in the service of their country". With a maxim such as this, it was easy for him to maintain that Elizabeth's coercive measures were political and not religious. To say that he was Machiavellian is meaningless, for every statesman is so, more or less; especially in the 16th century men preferred efficiency to principle. On the other hand, principles are valueless without law and order; and Burghley's craft and subtlety prepared a security in which principles might find some scope. The most prolonged of Cecil's surviving personal correspondences, lasting from 1566 until 1590, is with Nicholas White, an Irish judge. It is contained in the State Papers Ireland 63 and Lansdowne MS. 102, but receives hardly a mention in the literature on Cecil. White had been a tutor to Cecil's children during his student days in London, and the correspondence suggests that he was held in lasting affection by the family. In the end, White fell into a Dublin controversy over the confessions of an intriguing priest, which threatened the authority of the Queen's deputised government in Ireland; out of caution Cecil withdrew his longstanding protection and the judge was imprisoned in London and died soon after. White's most remarked-upon service for Cecil is his report on his visit with Mary, Queen of Scots, in 1569, during the early years of her imprisonment. He may have published an English translation of the Argonautica in the 1560s but no copy has survived. Cecil has been a character in many works of fiction connected with Elizabeth I's reign. He has long been considered a likely model for the character of the King's calculating minister Polonius in William Shakespeare's Hamlet. Richard Attenborough depicted him in the film Elizabeth. He was played by Ben Webster in the 1935 film Drake of England. He was a prominent supporting character in the 1937 film Fire Over England, starring Laurence Olivier, Vivien Leigh, and Flora Robson; Burghley (spelled Burleigh in the film) was played by Morton Selten. He also appears in the television mini-series Elizabeth I with Helen Mirren, played by Ian McDiarmid; was portrayed by Ronald Hines in the 1971 TV series Elizabeth R; by Trevor Howard in the 1971 film Mary, Queen of Scots (1971); and by Ian Hart in the 2005 miniseries The Virgin Queen. He is portrayed by David Thewlis in Roland Emmerich's Anonymous. Cecil is also portrayed by Ben Willbond in the BAFTA award-winning children's comedy television series Horrible Histories; in the spin-off film, Bill, he was played by Matthew Baynton. In the BBC TV miniseries Elizabeth I's Secret Agents (2017, broadcast on PBS in 2018 as Queen Elizabeth's Secret Agents), he is played by Philip Rosch. Cecil appears as a character in the novels I, Elizabeth by Rosalind Miles, The Virgin's Lover and The Other Queen by Philippa Gregory, and is a prominent secondary character in several books by Bertrice Small. He also appears prominently in the alternative history Ruled Britannia, by Harry Turtledove, in which he and his son Sir Robert Cecil are conspirators and patrons of William Shakespeare in an attempt to restore Elizabeth to power after a successful Spanish invasion and conquest of England. In addition, he is portrayed as a young man in Lamentation by C. J. Sansom. Burghley also appears in the espionage novels of Fiona Buckley, featuring Elizabeth I's half-sister, Ursula Blanchard. The 'Elizabethan class' Airspeed Ambassador G-ALZU of BEA that crashed in 1958 in the Munich air disaster, was named Lord Burghley. ^ Albert Frederick Pollard, "Burghley, William Cecil, Baron". in Chisholm, Hugh, ed. Encyclopædia Britannica (11th ed.). 4:816. This page originally was a copy of Pollard's article. ^ Jane E. A. Dawson, "William Cecil and the British Dimension of early Elizabethan foreign policy," History 74#241 (1989): 196-216. ^ "CECIL DAVID, (c.1460-?1540), of Stamford, Lincs". Hist of Parliament Online. Retrieved 6 November 2012. ^ "Cecil, William (Lord Burghley) (CCL535W)". A Cambridge Alumni Database. University of Cambridge. ^ Stefania Tutino, Law and Conscience: Catholicism in Early Modern England, 1570-1625 (Aldershot: Ashgate 2007) pp. 61-62. ^ R. Verstegan and A.G. Petti (ed. ), The Letters and Despatches of Richard Verstegan (c. 1550-1640) (London: Catholic Record Society 1959) p. 59. ^ a b Beckingsale, p. 206. ^ a b Beckingsale, p. 207. ^ Yates, Julian (2003). Error, Misuse, Failure: Object Lessons From The English Renaissance. Minneapolis: University of Minnesota. p. 160. ISBN 978-0-8166-3961-8. Queen and council shared this worry…the return of "Jesuitized" gentlemen…and developed a…system…of detection…to make manifest the treasonous practices of the Jesuit underground. ^ Nicolini, Giovanni (1854). "Proceedings of the Jesuits throughout Europe". History of the Jesuits. London: Henry Bohn. pp. 153–168. OCLC 776882. ^ Weston, William (1955). Caraman, Philip (ed.). An Autobiography from the Jesuit Underground. New York: Farrar, Straus and Cudahy. OCLC 813425. ^ Alford, Stephen (2008). Burghley: William Cecil at the Court of Elizabeth I. ^ Leatham, Lady Victoria (1992). Burghley:The life of a great house. Herbert Press Ltd. ISBN 978-1-871569-47-6. ^ a b Husselby, Jill; Henderson, Paula (2002). "Location, Location, Location! Cecil House on the Strand". Architectural History. SAHGB Publications. 45: 160–164. doi:10.2307/1568781. JSTOR 1568781. ^ Lawrence Stone (2001). The Causes of the English Revolution, 1529-1642. p. 83. ^ Albert Frederick Pollard, "Burghley, William Cecil, Baron". in Chisholm, Hugh, ed. Encyclopædia Britannica (11th ed.). 4:816. ^ French, George Russell. "Notes on Hamlet." Archived 10 October 2008 at the Wayback Machine In Shakspeareana Genealogica. London: Macmillan & Co., 1869. pp. 299–310. ^ "Elizabeth R". IMDb. Imdb.com. Retrieved 1 January 2014. ^ "1958: United players killed in air disaster". 6 February 1958 – via news.bbc.co.uk. ^ McConnell, Paul (5 February 2015). "Munich Air Disaster". mirror. ^ The house, on the site of the rectory of St Clement Danes, was built by Sir Thomas Palmer, disgraced for his support of Lady Jane Grey and executed with John Dudley, 1st Duke of Northumberland in 1553. This article incorporates text from a publication now in the public domain: Pollard, Albert Frederick (1911). "Burghley, William Cecil, Baron" . In Chisholm, Hugh (ed.). Encyclopædia Britannica. 4 (11th ed.). Cambridge University Press. pp. 816–817. Dawson, Jane E. A. "William Cecil and the British Dimension of early Elizabethan foreign policy," History 74#241 (1989): 196-216. Loades, David. The Cecils: Privilege and Power behind the Throne (2007). Loades, David. Elizabeth I: A Life (2006). Maginn, Christopher. William Cecil, Ireland, and the Tudor State (Oxford University Press, 2012). Burghley, William Cecil, baron, The Execution of Justice in England, 1583. Facsimile ed., 1936, ISBN 978-0-8201-1175-9. Wikimedia Commons has media related to William Cecil, 1st Baron Burghley. Wikisource has the text of the 1911 Encyclopædia Britannica article Burghley, William Cecil, Baron. "Archival material relating to William Cecil, 1st Baron Burghley". UK National Archives. William Cecil (1521–98) at luminarium.org, Excerpted from Encyclopædia Britannica, 11th Ed. Vol IV.